Will the HP 364 XL cartridges fit into the carriage of my HP Photosmart Premium C310a printer? When the printer was supplied, it came with standard HP 364 cartridges and I've not yet attempted to fit XL cartridges. Yes, the HP 364XL ink cartridges are compatible with the HP Photosmart Premium C310a e-All-in-0ne printer and can be used as an alternative to the standard sized HP 364 cartridges. XL just means the cartridges are filled to a higher capacity, although they have the same physical size. I have a HP Photosmart Premium e-All-In-One C310a printer. The ink level for the photo cartridge is showing low on the printer, even though I've never printed any photos. Do I need to replace this cartridge? I don't intend to print any photos but need to keep my printer working. Your help would be appreciated. Many thanks. The Photosmart Premium C310a e-All-in-One printer uses a standard black for normal text printing. The photo black is used to print high quality black and white photos and also in colour prints to enhance tones and contrasts within the images. Therefore, even though you might not be printing directly in black you can still use up the photo black ink when printing colour images. Once the photo black ink has run out you'll need to replace the cartridge in order to keeping printing. What's the difference between HP 364 and HP 364XL? I have a HP Photosmart Premium C310a and on the inside it says '364' without the 'XL'. Any ideas? The difference is the capacity of the cartridges. HP 364 ink cartridges are the standard capacity type whereas the HP 364XL ink cartridges are the high capacity type which contain more ink. If you print frequently you'll save money by using HP 364XL ink cartridges as they're more economical. My printer uses two black cartridges but your site only mentions one. Are both black inks the same cartridge? The printer information suggests one is a special, for photos etc. Can you please advise? Your HP Photosmart Premium C310a printer does require two different black cartridges; a standard black cartridge and a photo black cartridge. Both are listed under your printer model on this page of our website and they both come in a standard (HP 364) cartridge as well as a high capacity (HP 364XL) cartridge. Boasting support for various document and image file formats, ePrinting, and a whole range of HP web apps, the Photosmart Premium e-All-In-One C310a is a multifunction printer with high quality output and superior scanning and copying capabilities. It is also quite affordable for its size. However, some users report bugs and system crashes. 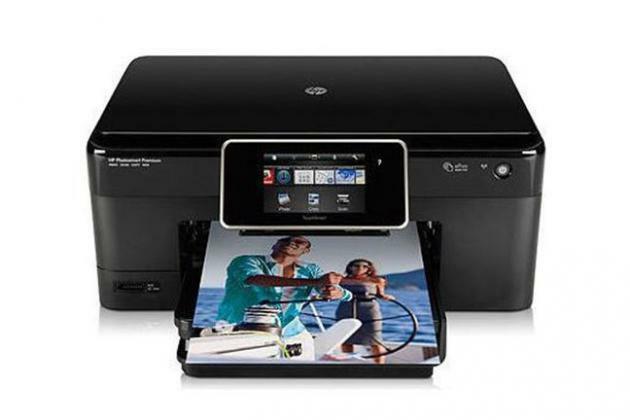 The HP Photosmart Premium e-All-In-One C310a is comparable to a smart phone with its touch screen interface, wireless printing, and applications. Designed to meet the needs of small businesses, this streamlined workhorse has a glossy black surface and rounded corners. The touch screen measures 4.3 inches. The printer supports a variety of image and document files including .docx, .doc, PDF, PNG, and JPEG. A range of onscreen apps provide shortcuts to basic functions. It's easy to send data wirelessly to the Photosmart Premium e-All-In-One C310a. The ePrint Center provides instant access to weather reports, news articles, coupons, and others. The ePrint function also lets you print from smart phones and tablet PCs that do not have USB ports compatible with printers. While Photosmart Premium e-All-In-One C310a claims to support a variety of file extensions, it cannot handle TIFF images. The print quality of pictures and documents is quite average; some users also say that pictures appear 'too vibrant,' far from the original. Some report seeing vertical lines on the image. The ink smudges rather easily after printing. There are also reports of the print head getting clogged when the machine is not used frequently. The system also tends to freeze, and the touch-screen technology needs improvement when it comes to response time. Both your wireless device and the printer have to be connected to the Internet through a wireless router so you can use the ePrint Center apps.